Today there are nearly six million children under the age of five living in poverty in the world's richest country. Blanket statements are often tossed around in the political arena, public debate sphere, and progressive rhetoric. But the statistic remains intangible for many Americans, likely because the root causes, effects, and implications are multifaceted and complex, and are often hard to understand for the average American living a much different reality. What is needed is a clear and thorough discussion of this epidemic, and Behind from the Start answers that call. Author Lenette Azzi-Lessing examines what lies behind the stubbornly high rate of poverty among young children in the U.S. and the resulting consequences, both for the children themselves and for America as a whole.Behind from the Start examines the link between America's shaming, blaming, and marginalizing of poor parents, and our punitive welfare policies that jeopardize the life chances of vulnerable young children, thereby maintaining the cycle of chronic poverty. Research has shown that the experience of poverty in the first years of life is particularly harmful, blunting physical and brain development, increasing the risk for chronic health issues and injury, and limiting a person's lifelong capacity for learning and success. 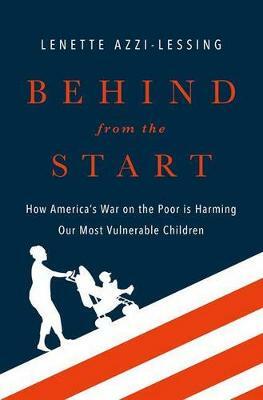 In debunking the myths that help perpetuate the cycle of poverty in the world's richest country, Lenette Azzi-Lessing reveals how negative public and political discourse regarding poor families impacts the poorly conceived and fragmented programs intended to support them, which have in turn failed to meet their aims. She considers the cultural and political forces that contribute to intergenerational poverty in the U.S., the consequences for the millions of young children in families stuck at the bottom of our economy, and the beneficial impacts that would be felt country-wide in fixing some of these persistent problems. Drawing upon knowledge from diverse fields, including neuroscience, media studies, and public policy, as well as the author's experiences on the front lines as a practicing social worker, Behind from the Start offers a fresh take on this shameful problem and its solutions.